You don't need to travel around the world to know that France's Bastille Day is a time to celebrate (we're sorry). The holiday marks the anniversary of the storming of the Bastille, which represented the end of tyranny in France and the beginning of a democracy. 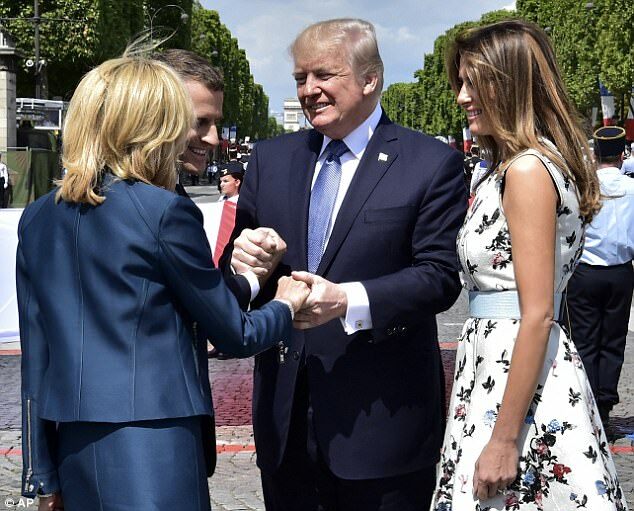 Trump, who's now hanging out in France with President Emmanuel Macron, was watching the Bastille Day parade when the army casually performed a medley of French electro duo Daft Punk. A recent post on Pitchfork brought this delightfully horn-heavy marching band medley to our attention and we have to admit that it kind of makes us want entire Daft Punk albums performed in this manner. In a video from The Guardian, you can see Macron recognize the melody, and slowly his smile turns into a modest head nod for "Digital Love", which is also my guaranteed-to-get-me-to-the-dancefloor jam. The celebration might have been better appreciated by Press Secretary Sean Spicer, who is more familiar with the French electronic duo. But despite the apparent follicle enjoyment - and others breaking into joyful applause at the performance - Trump remained stoic.